Kevin Meyers was promoted to USHL Director of Media and Communications following his second full season with the league. The United States Hockey League announced today that Kevin Meyers has been promoted to Director of Media and Communications, effective immediately. 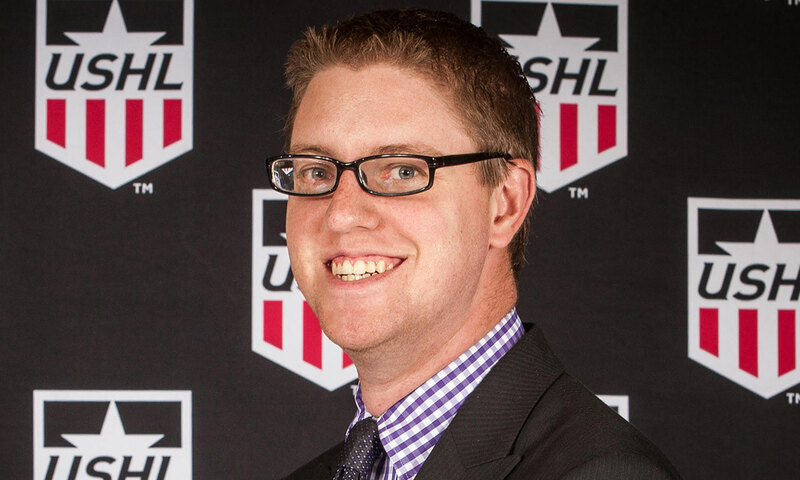 Meyers recently completed his second season as the USHL's Communications Coordinator and has been responsible for day-to-day oversight of League social media platforms and USHL.com. Recently, he has also served as the point of contact for all USHL media matters, including leading media efforts at the USHL Draft, Clark Cup Final, USHL Combines and NHL Draft. "Kevin has done an outstanding job since joining the League Office," said USHL President and Commissioner Tom Garrity. "He is a perfect fit to lead the USHL's communications department moving forward." The 26-year-old Meyers joined the USHL as a Media Intern in September 2015 before being named Communications Assistant and then Communications Coordinator in December 2016. In addition to his other responsibilities, Meyers served as host and producer of The U-Show podcast and was instrumental in helping to create the first USHL media guide dating back to the beginning of the USHL's all-junior era, including the recovery of USHL historical information such as boxscores, statistics and other league history dating back to the USHL-MJHL merger in 1979. A 2014 graduate of Bowling Green State University, Meyers’ previous experience includes various roles in hockey broadcasting. He served as a play-by-play broadcaster and color analyst for Bowling Green during his time at the school and also spent time as a fill-in broadcaster for Boston College as well as the USHL’s Chicago Steel. Prior to joining the USHL staff in 2015, Meyers worked for STATS, LLC. and the WNBA's Chicago Sky. Meyers is a native of Roselle, Illinois and graduated from Bowling Green State University with a degree in Sport Management.